This 2.5 Gallon Barrel Jar With Lid is the perfect entertainer. 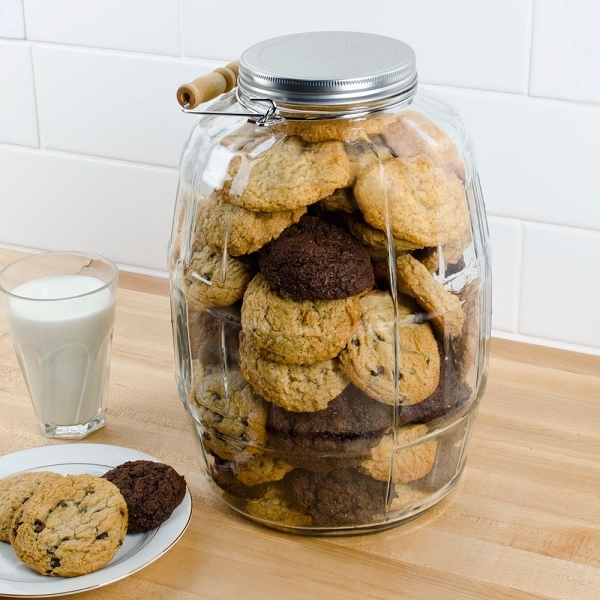 An awesome see-through jar is great for snacks. 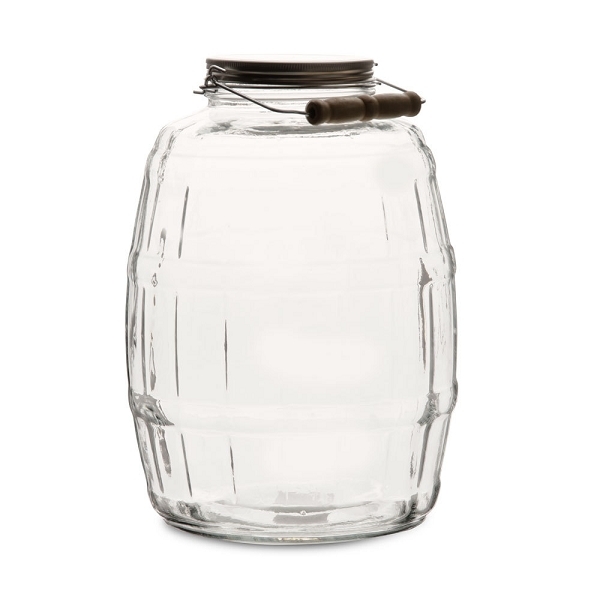 The glass lidded barrel jar can also be used for ladling up beverages like lemonade or sangria. These wholesale glass canisters are durable, versatile, and easy to clean. 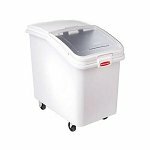 These containers made of glass are provided with a lid for convenient fresh storage and a handle for convenient carrying. The barrel canisters are great for placing anywhere to save space. Look at all of the glass jars available and purchase yours today. When you think about glass jars as storage and display tools, you probably imagine them sitting on the shelves or countertops of candy stores, convenience stores, specialty shops, or restaurants. However, many other kinds of businesses purchase wholesale glass jars to organize and display a variety of items. Lots of folks even use them as organizational tools in their homes! Consider the following examples and think about how wholesale glass jars can work for you. As far as storing medicines is concerned, regular glass jars aren't suited as pharmaceutical containers. However, many health professionals such as doctors and dentists use glass jars with lids to store a variety of health tools. Unwrapped items like cotton balls, gauze, and tongue depressors. Glass jars with lids are best suited for these items in order to keep them safe from contamination. Wrapped items like bandages, packets of ointment, sample toothbrushes, and trial-sized containers of toothpaste and mouthwash. Doctors can even keep goodies like lollipops as treats for children after their appointments! Rather than leaving them on the sink countertops or requiring guests to call the front desk and request extras, hotels and motel managers can purchase wholesale glass jars to organize their bathroom displays of complimentary items. Travel-sized items like bottles, containers, or bars of soap, shampoo, shaving cream, lotion, toothpaste, and mouthwash fit perfectly in these jars, as do other items like disposable razors, combs, and toothbrushes. Hotels and motels can also use glass jars to add elegance to their displays of other complimentary items like packets of coffee, sugar, and sweetener as well as plastic utensils, hand wipes, straws, and coffee stir sticks they provide in their rooms. Regardless of what you do for a living and how glass jars can help your business, know that these containers are ideal tools for organizing your own home! Purchase wholesale glass jars to organize your toiletries and hygiene products such as cotton balls, Q-Tips, bandages, and travel- and trial-sized packets and bottles of medicated ointments, shampoos, soaps, and lotions. 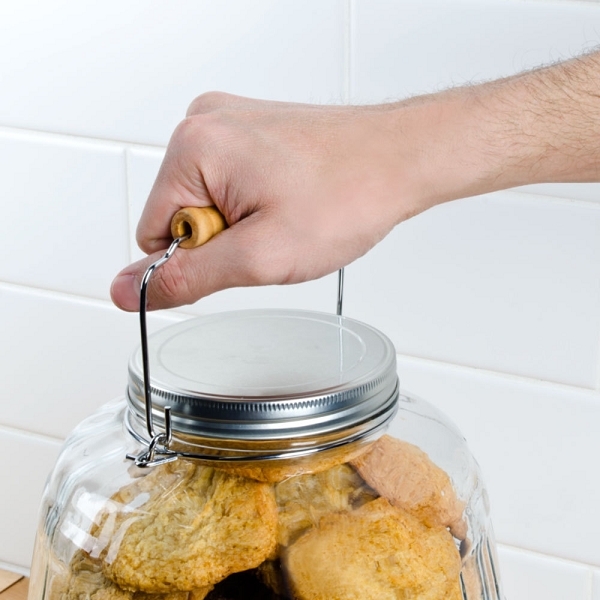 Find wholesale glass jars with lids to organize your baking and cooking supplies such as flour, sugar, salt, and cornmeal, or extras such as ice cream sprinkles. Store your drinking straws in these jars to keep them safe from contamination. Create attractive displays and allow your family members and friends to see what kinds of treats you have to offer by storing foods like cookies or trail mix in glass jars with lids. The jars are great tools for cutting down on waste. Use them to keep organized and handy extra items such as the packages of plastic utensils and packets of salt, pepper, and sugar you have left over from fast food restaurants.